Watercress is a sharp-tasting herb that grows abundantly alongside streams and creeks. It has been used in cooking for centuries; watercress soup, for example, is a classic in many cuisines. Watercress can be found in and around streams, lakes, and creeks that have a good flow of clear water. 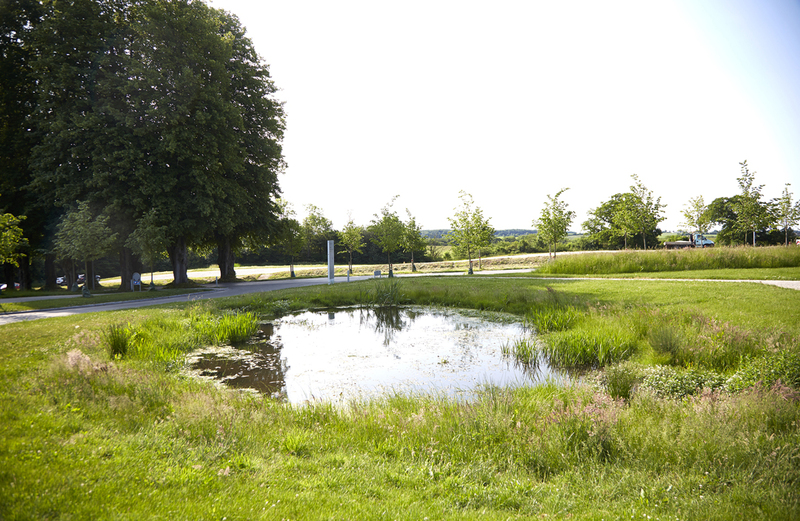 It can grow on the banks or in the water itself (though in that case, part of the plant will be hidden). Take care not to pick watercress in streams where cattle or sheep graze nearby, as infected animals can transmit a liver fluke parasite to humans. You can normally pick watercress from May until November, but in milder winters you might be lucky enough to find it growing year round. Entire plant: May, June, July, August, September, October, November. Watercress can grow 40-60 cm high and has hollow, succulent stems. The leaves are oval-shaped and look like small water lilies. They grow in pairs on side shoots off the main stem and end in a single round leaf. Smooth all over, the plant develops small, white flowers that are yellowish-green in the center. Cut or snip the young shoots off the plant. When watercress blossoms, its sharpness intensifies, so unless you can't get enough of that flavor, avoid gathering it then. 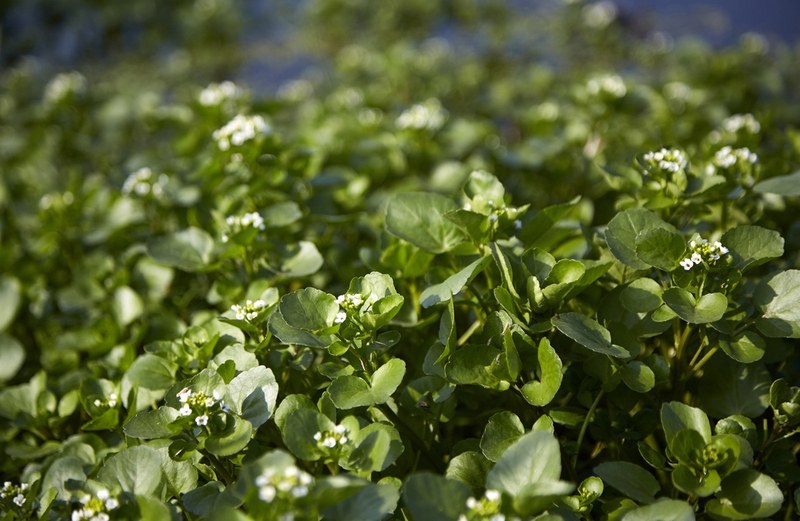 Watercress has a sharp and peppery flavor with a nutty aftertaste. The flavor gets more intense as you chew. Watercress feels crisp and sharp on the palate and numbs the mouth a bit like pepper or horseradish. The plant itself has no particular scent, but if you break off parts of it, you can get a subtle green aroma. Watercress can't tolerate heat—even mild—so it's best to use it raw, add it at the end of cooking, or use it to top off warm dishes. It's good mixed in a soup or sauce once you’ve removed it from the heat. Watercress can, however, tolerate careful sautéing or blanching. You can ferment, pickle, or steam the slightly larger, crisp, hollow stems. Use watercress to add sharpness to recipes, especially in those where you would normally use horseradish—in a fricassee, for example. Its sharpness cuts beautifully through rich flavors and can, for example, enliven fatty cuts of meat and pâtés. Use watercress with bland ingredients, such as eggs or potatoes. Watercress is good for highlighting the metallic elements in shellfish like oysters and mussels. Sauté watercress briefly with spinach to bring out the metallic flavor in the spinach. Cover the watercress with a moist cloth and store in a sealed bag or airtight container inside the crisper drawer of your refrigerator, where it will stay fresh for up to one week. Other strong herbs such as cuckoo flower, hairy bittercress, shepherd's purse, and common scurvygrass can be substituted for watercress. The leaves of watercress can be mistaken for the toxic plant lesser celandine, which doesn't grow in water, but in moist soil. Lesser celandine lacks watercress’s stem, growing instead in blankets close to the ground. 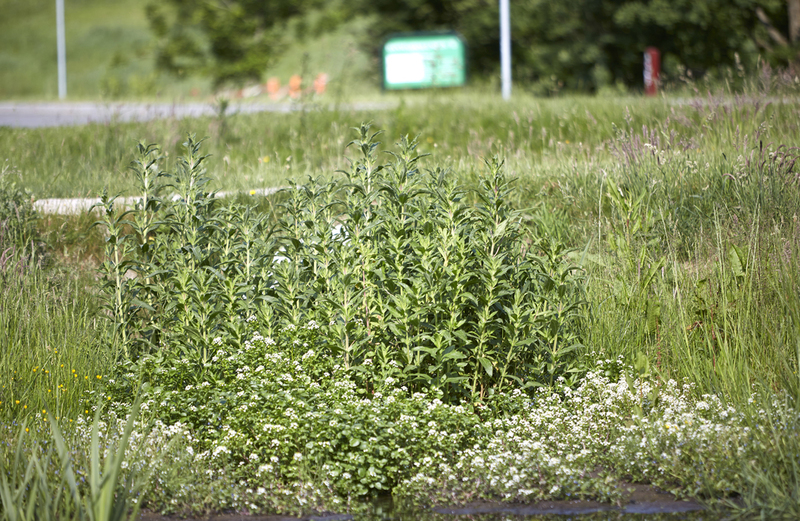 It develops yellow flowers and doesn't have the characteristic, sharp flavor of watercress. Lesser celandine isn't poisonous in small amounts, so you can taste a bit of it and check if in doubt.